I was stuck on a train on early Sunday evening with my pocket DAB radio at least allowing me to drift off to Toronto. The Blue Jays were hosting the Yankees and thanks to BBC 5 Live Sports Extra I could listen in while on the move. I had tried the same diversionary tactic the previous Sunday only to be plagued by a less-than helpful commentary team that constantly skipped over the important details of the game (number of outs, runners on base etc), which is not what you need when sitting in a noisy carriage. This time I came prepared with an A6 notebook and a biro so that I could both keep a track of the game action and keep a hold on my sanity above the din and inconvenience of a group of parents and kids treating the train like their front room (in a house I’d gladly avoid). My impromptu scoring method involved simply noting down the outcome of each plate appearance, underlining ones ending or turning into an out. This allowed me to be sure at any moment where we were in the game, how many outs there were and how many people were on base. I didn’t keep a track of stolen bases, such as the pair stolen by Rajai Davis in the fourth inning, so I didn’t always know exactly where the runners were, but it was much better than nothing. I also didn’t include player names, batting orders and the like as the commentators were always good at mentioning them (in fairness, the commentators in this game were much better than the previous Sunday and did keep a decent regular check on the game situation) and this wasn’t a scorecard I would be creating stats from. 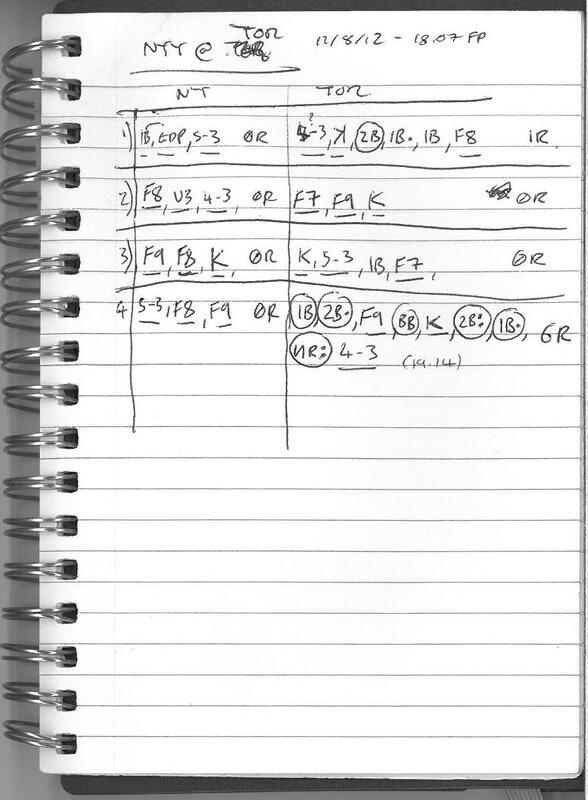 It’s just a simple running log of what happened as the game went along to accompany the commentary, with runs shown by a circle around each plate appearance that came around to score and dots where a plate appearance resulted in that player gaining any RBI. The game had reached the end of the fourth inning at the point when I turned off my radio before alighting at my destination. Phil Hughes had just been bludgeoned for six runs in the inning to give the Blue Jays a 7-0 lead and the game ended in a 10-7 victory for Toronto. 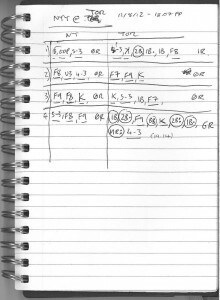 I didn’t catch those remaining innings and my ‘scorecard’ is therefore imperfect in many ways, but as a simple scoring method devised on the fly it worked perfectly well enough. Scoring is all about recording information in a way that the situation necessitates (and permits). Judged against these criteria it’s a commendable effort!